This is a story about planning, foresight, myths, reality, and the oak beams of College Hall at New College, Oxford. The first time I heard about the oak beams of College Hall, was in Danny Hillis’ Wired article about the 10,000 year clock, now the flagship project of the Long Now Foundation. He’s retelling it from Stewart Brand, who tells the story as a kind of morality fable in the excellent book and TV series How Buildings Learn. Summary: New College at Oxford was founded in the late 1300s. The great dining hall was built with enormous oak beams. In the late 1800s, they discovered that there were beetles in the beams. 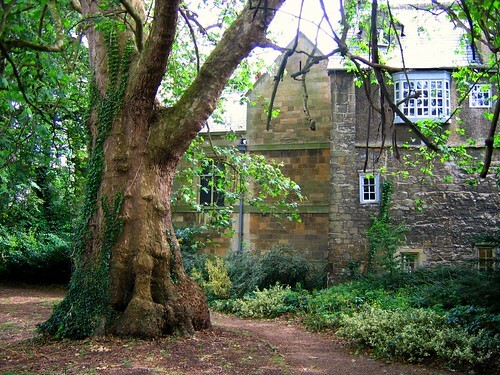 Dismay ensued – no one knew where they’d find oak trees big enough to replace the lost beams. Someone had the bright idea to summon the college forester and ask him if there was any oak available. The forester (and for some reason, Brand gives him a kind of bumpkin accent) does have such oaks. It turns out that a stand had been planted and set aside when the great hall was built and while everyone at the college had forgotten about them, the forestry people had been under strict orders passed down for 500 years. Brand ends the story thus: “That’s the way to run a culture.” The implication being (given that all the college people had lost track of the oak) that we aren’t running ours that way anymore. Hillis’ version is even more accusatory. The 14th-century builder had planted the trees in anticipation of the time, hundreds of years in the future, when the beams would need replacing. Did the carpenters plant new trees to replace the beams again a few hundred years from now? A timely message of prudence and foresight which, fortunately, differs from reality in two important ways. In 1859, the JCR told the SCR that the roof in Hall needed repairing, which was true. In 1862, the senior fellow was visiting College estates on ‘progress’, i.e., an annual review of College property, which goes on to this day (performed by the Warden). Visiting forests in Akeley and Great Horwood, Buckinghamshire (forests which the College had owned since 1441), he had the largest oaks cut down and used to make new beams for the ceiling. It is not the case that these oaks were kept for the express purpose of replacing the Hall ceiling. It is standard woodland management to grow stands of mixed broadleaf trees e.g., oaks, interplanted with hazel and ash. The hazel and ash are coppiced approximately every 20-25 years to yield poles. The oaks, however, are left to grow on and eventally, after 150 years or more, they yield large pieces for major construction work such as beams, knees etc. Now THAT’s the way to run a culture. The problem with the foresight described in Brand’s version of the story is that it’s incredibly fragile. What if the dining hall had burned down before the oaks had regrown? What if the one stand of oaks had burned? What if no one had thought to talk to the foresters? What if the foresters had all died at some point, breaking the transfer of knowledge? New College’s actual method is much more robust. Cultural continuity is ensured by regular visits keeping the foresters and college administrators in touch. Materials continuity is ensured by having redundant oaks spread over the college lands. No one oak is destined to be the future beam at College Hall. Instead, they have A BUNCH OF OAK, available for whatever purpose might arise, including burning the great hall to the ground, three years in a row. Take this lesson. Apply it to your work.